Saturday and Sunday from 12 noon until 4 p.m.
most of which you've seen on the blog. and did this small painting. Labels: acrylic on canvas. still life. St. Clair Artwalk. studio tour. Have fun. 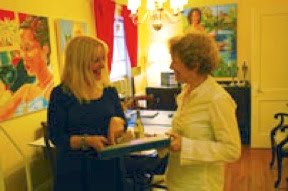 In the photo of last year's tour your studio full of paintings looks full of life and spirit - and you're lovely and very happy looking, Barbara. (All the best with this year's!) Your tomatos look delish, too! I hope your paintings all find new homes! Hope the St. Clair Artwalk studio tour goes well...I love the picture of you with your friend in your studio, it looks very inviting and a delight to visit. I love your painting of the tomatoes, joyful and respendant. How I wish I could come to your studio tour and see you and your works in person. I hope you have lots of visitors and sales! The only thing better than a fresh tomato is a beautiful fresh tomato. I'll bet you enjoyed these for lunch! Thanks so much. I do feel happy when I'm showing my work on the studio tour. Thanks for the compliment on the tomatoes. They are really good. You can't find good tomatoes in the store this year, but they're at the farmers' market. I am probably not making enough of a fuss about it, because it's this weekend, but I do have a heck of a lot of work to do to get ready. I have to invite people. I guess that's step one. Thanks so much for your good wishes. The studio looks a bit brighter there than it is now. I toned down the curtains for a TV interview about my work. But the paintings and walls are still bright. If you're down this way, let me know and I'll tell you how to get here. But I think you're in a studio tour of your own. I hope that goes well. I would sure love to see you here. You might have to introduce yourself because I don't know what you look like! But I think I'd know your wonderful work and creativity anywhere. summer taste memories because we know big, bad winter is over the horizon. I think I'd faint dead out if you showed up on my doorstep, but I'd be certain to offer you a glass of wine, and show you around. By the way, your tomatoes look great - so shiny and juicy!